The $300 Nest Cam IQ has some pretty cool features, but it’s also missing some even better features that are found on cameras you can buy for a fraction of that price. 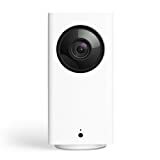 Take the Wyze Cam Pan 1080p Pan/Tilt/Zoom Wi-Fi Indoor Smart Home Camera, for example. It does everything you would expect from a wireless home security camera and it even works with Alexa. On top of all that, you can remotely pan around and even zoom using the smartphone app!